Properties in State of Rio de Janeiro average 4.7 out of 5 stars. Property 55: Make yourself at home in the best point of Copacabana (beach square)! Property 58: Spacious 3 Bedrooms Next to Copacabana Beach and Arpoador! At the heart of Arpoador, finely decorated for your comfort !!! Property 59: At the heart of Arpoador, finely decorated for your comfort !!! Modern 3BR with ocean view, few steps to the beach! Property 64: Modern 3BR with ocean view, few steps to the beach! Praia do Forte - Excellent location - 100 meters from the beach. Property 69: Praia do Forte - Excellent location - 100 meters from the beach. Apt in Prainha, 1 bedroom, 120 m from the beach, elevator, parking space and TV with Sky. Property 70: Apt in Prainha, 1 bedroom, 120 m from the beach, elevator, parking space and TV with Sky. 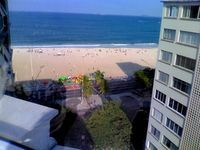 Property 77: Copacabana beach block in the most popular street with lots of comfort! long or short season !! !Next to the Copacabana Fortress !!! Property 79: long or short season !! !Next to the Copacabana Fortress !!! 01 Qt in Arraial do Cabo, the Brazilian Caribbean! Property 82: 01 Qt in Arraial do Cabo, the Brazilian Caribbean! Property 89: Family friendly, large, natural light, charming, cozy. Copacabana of the 50's. REVEILLON, CARNIVAL, FAIRS, EVENTS, RIOCENTRO, OLYMPIC PARK, ROCK IN RIO ..
Property 97: REVEILLON, CARNIVAL, FAIRS, EVENTS, RIOCENTRO, OLYMPIC PARK, ROCK IN RIO ..
No solo estoy conforme por la calidad del apartamento, sino por la calidez humana de Joi, su propietaria. Atenta y preocupada por nuestra comodidad y necesidades. El.lugar es muy acogedor, hermosa vista y en un lugar de privilegio.